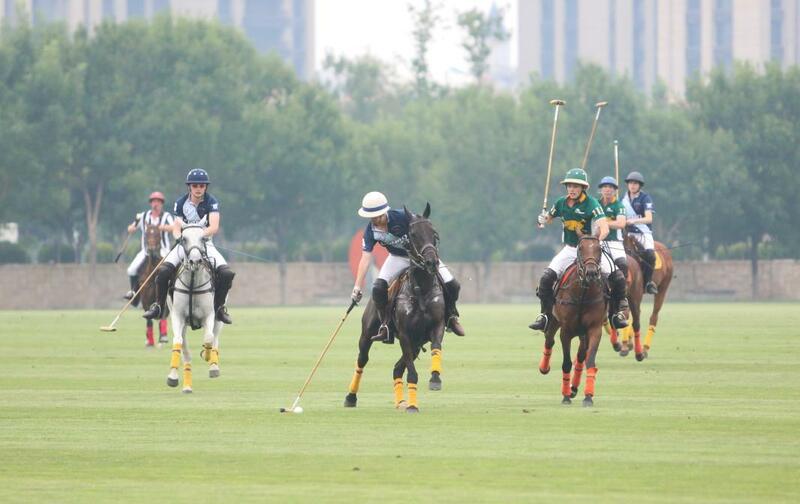 Tianjin, China, 14 July 2016 – Day three of the Metropolitan Intervarsity Polo 2016, aka The London Challenge in Tianjin, northeast China saw holders The University of London Polo Club beaten by Harvard University Polo Club 6-4 in a tense, high quality match. After Harvard’s impressive victory debutants Skidmore Polo Club put The University of Cambridge Polo Club to the sword with a comprehensive 10-3.5 victory. 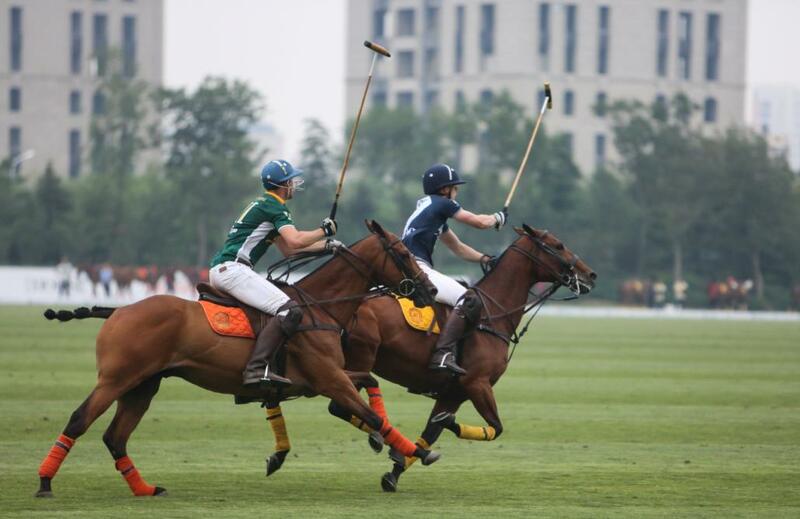 The results leave the competition delicately poised, with The University of Oxford Polo Club the only team to have clocked up two wins out of two over the first three days of the annual event, which is taking place for the fourth time in the opulent grounds of the Tianjin Goldin Metropolitan Polo Club. The players, representing the cream of universities from both the US and UK, have had to contend with changing conditions over the course of the tournament so far. On the first day of the event light rain created a muggy atmosphere, then yesterday saw blazing sunshine create a hard surface to perform on. Today was far milder, with London seeming to instantly warm to the conditions by storming to an early lead against their Harvard opponents. London’s Ali Jumabhoy, one of the standout players of the tournament so far, put his team ahead with a close range hit after immense pressure from the UK team from the off. 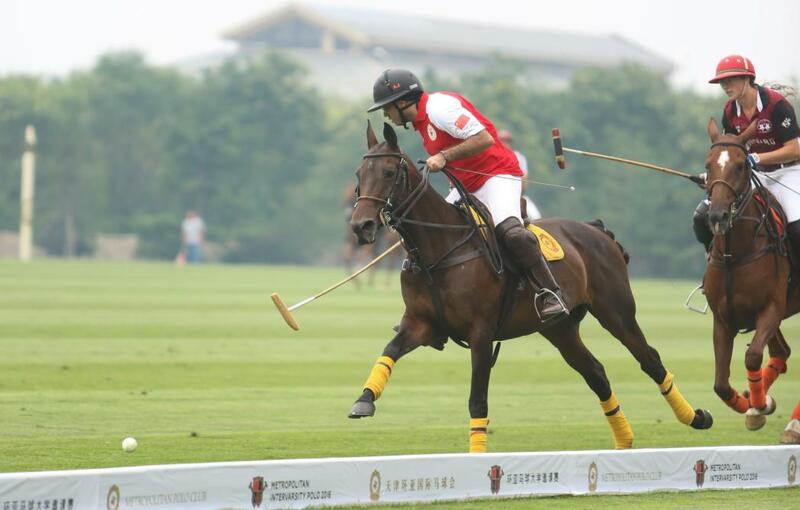 When he hit home again in the first chukka it seemed like it was London’s day. That notion was compounded shortly afterwards, when Harvard’s Danielle Lussi, who looked so assured earlier in the week, failed to make a connection as the last line of defence following a through ball, leaving London’s Natascha Hedegaard the chance to fire home for a 3-0 lead. 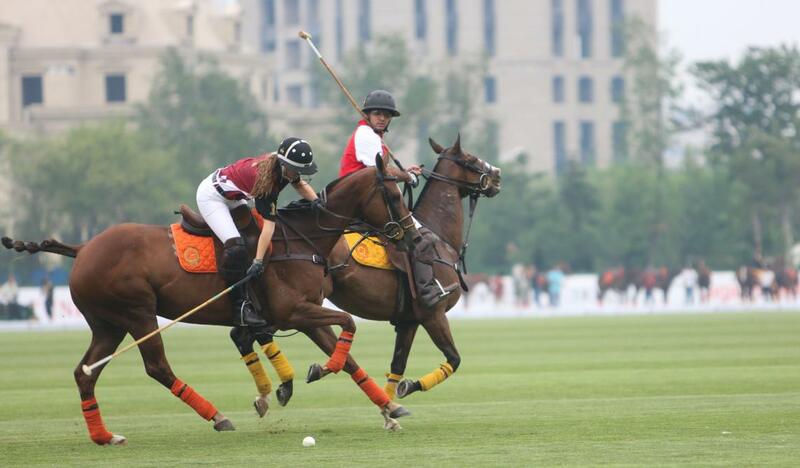 Harvard refused to roll over, though, storming back in the second chukka with three goals to level the match. Eliza Bird, for Harvard, had a great chance to score following a scramble for possession but was squeezed out, then seconds later her teammate Thomas Waite broke from the right flank and made no mistake with his confident finish. Lussi followed up with a somewhat fortunate goal from a Harvard free hit, then scored a spectacular effort to even the scores before the end of the chukka. With the goal of the game so far she made a purposeful ride from the centre of the pitch, made a calm approach shot then turned the ball home. It was a goal that characterised the stormingly direct attacks she had been leading throughout the tournament. 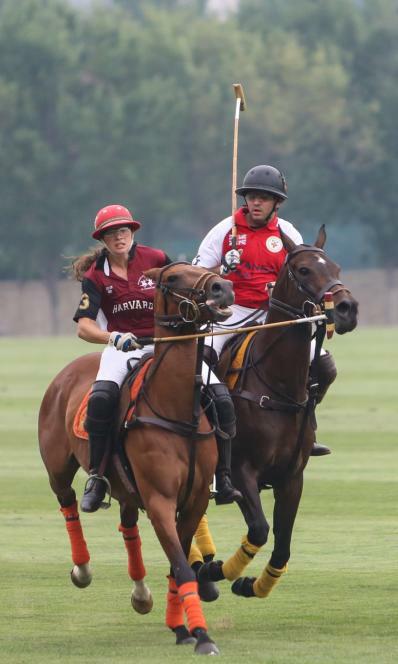 By the third chukka the Harvard players’ tails were being helf higher than their steeds’, and when they were awarded a 30-yard free hit there was little doubt that Lussi would put it home – and she duly did. Waite doubled his personal tally of the match with a scintelating goal, galloping forward at breakneck speed but still deftly dinking home despite the difficulty of the hit he had created for himself due to his pace. With the turnaround complete London could have capitulated, but clawed the score to 5-4 to Harvard early in the fourth chukka with an amazing run from Arthur Cole-Fontayn – who had been the team’s outstanding player prior to the third day. He would have been a contender for goal of the tournament if he’d finished off his incredible run, but scuffed his shot wide before making up for it with an easier finish shortly afterwards. Lussi was still looking dangerous near the death of the match, and it was no surprise when she made yet another impressive run, cut inside and finished coolly to give Harvard a 6-4 lead that they maintained to the final bell. The turnaround of the tournament was complete. Cambridge started their game against Skidmore with a 2.5 goal handicap, but it did them little help against the US debutants as they were taken apart by their US counterparts. 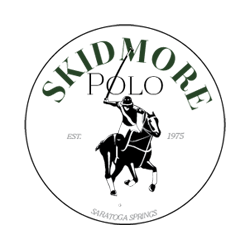 Charlie Bullis had been Skidmore’s talisman in the tournament so far, but it was team-mate Aaron Schneider who picked up on the latter’s pass to open the scoring, gliding home from a smooth Bullis pass from the left flank. Skidmore’s Schneider was on target again in the second chukka, as was Meggie Danielson, before Bullis chalked up his first of the game after yet another strong run from one of the most confident riders of the tournament, putting his team 4-2.5 up against the UK hopefuls. 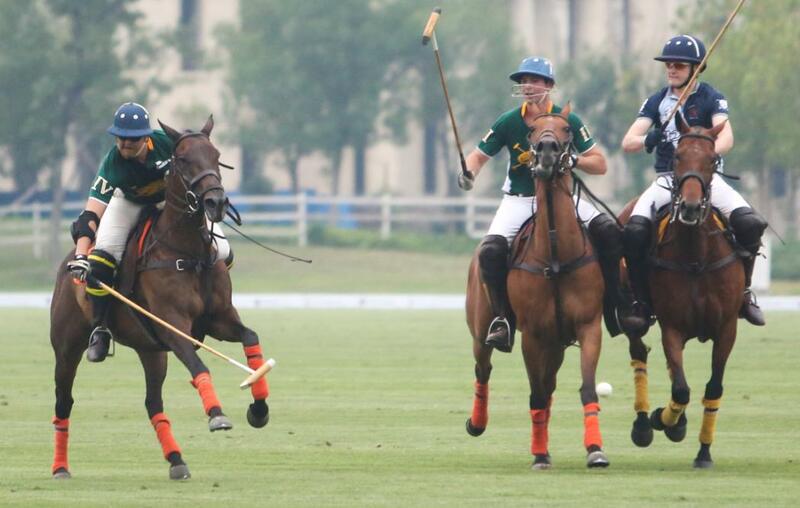 Cambridge had been whitewashed by their long-standing rivals Oxford yesterday 13-2, their only score being their handicap, and with Skidmore running rampant it looked like a similar result could be on the cards. Skidmore clocked up five goals in the second chukka, with Bullis doubling his personal tally for the match with an impressive run from the right flank that saw him steam forward, beating his marker to finish the job after his long range shot ambled towards the goal. In chukka three Aaron Schneider put Skidmore 7-2.5 up before Cambridge finally scored their first goal of the tournament with a strong mid-range shot from Theo Wethered, considered by many to be the team’s most talented player. There was a moment of drama when Skidmore’s Santiago Aventano was thrown from his steed, but he managed to brush off the cobwebs and ride again within moments to watch his team-mate Bullis pull off an incredible goal, losing Cambridge’s defenders easily and releasing a cutting shot to make the score 9-3.5. The fourth chukka was a quieter affair as Skidmore coolly brought the game home, adding one to their final tally of ten with a converted 30-yeard hit from Bullis. With Cambridge offering little steel or signs of a comeback, Skidmore’s class duly won them a comprehensive victory and ensured that they are leaving their mark on their first appearance at this prestigious event.